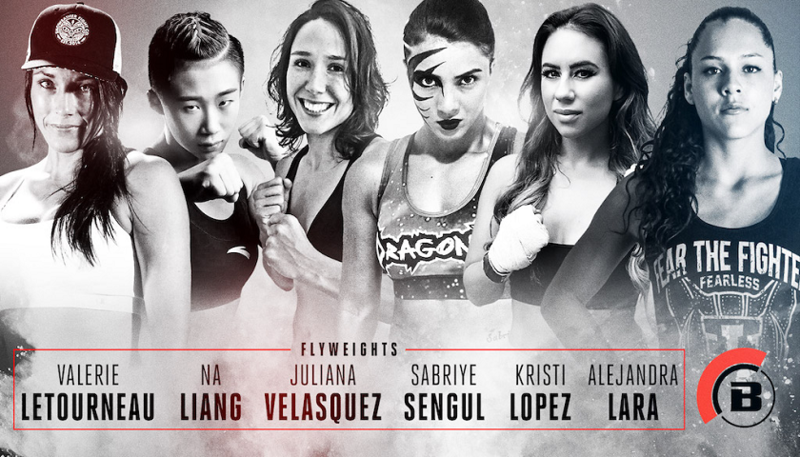 Bellator is pleased to announce the signings of Valérie Létourneau (8-6), Alejandra Lara (6-1), Sabriye Şengül (Debut), Kristi Lopez (2-0), Na Liang (6-0) and Juliana Velasquez (5-0) to multi-fight contracts that will see them compete in Bellator’s emerging 125-pound division. Additionally, Bellator will look to crown its next women’s flyweight world champion this year. Hailing from Medellin, Colombia, Alejandra Lara will look to make a statement in Bellator’s budding women’s flyweight division. The 22-year-old knockout artist has earned six victories in seven outings since making her professional debut in 2011. “Azul” has shown tenacity in her fights thus far, showcasing a pair of first round knockouts, as well as a first round armbar submission. Lara trains alongside UFC fighters Alexa Grasso and Irene Aldana at Team Lobo in Mexico. Fighting out of Hollywood, Calif., Kristi Lopez will enter the Bellator fray as she prepares for her third professional bout. Prior to that, “Loba” also tallied three victories over a four-fight, two-year span on the amateur circuit. Chinese submission specialist Na Liang will look to build on a 2017 campaign that already saw her finish an opponent in a mere 38 seconds. The first-round stoppage marked the fifth time in six appearances that Liang’s opposition failed to make it out of the opening round. After competing exclusively at bantamweight to begin her career, Liang decided to move down to the flyweight division, where she also saw success by collecting a trio of first round finishes.